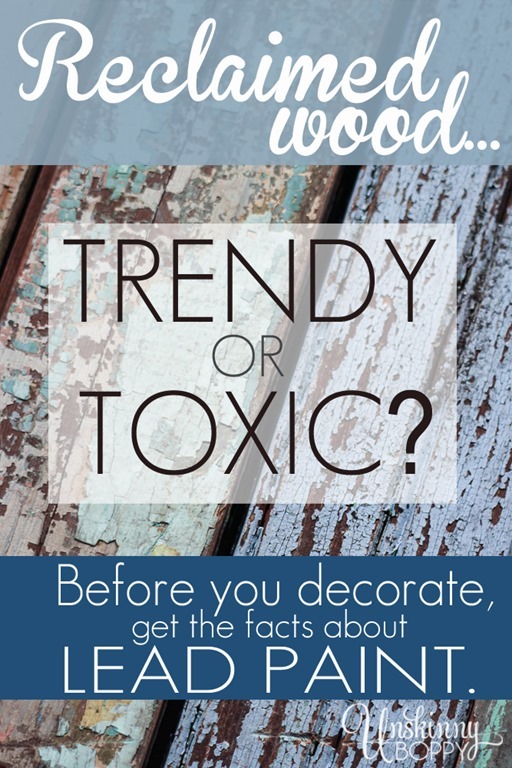 Reclaimed wood: Trendy or Toxic? When I was a little girl, I spent hours on the pier at our family’s river cabin casting my fishing pole into the water, waiting for the red and white bobber to get pulled under by a passing fish. My Papa patiently taught me how to bait a hook and then reel in a slippery, wiggling fish once he was hooked on the end of my line. He also taught me how to take a split shot lead weight and pinch it closed between my teeth around the fishing line. I used this method of weighting my line from the time I was five years old until I was well into my teen years and began fishing with egg and worm sinkers. Nowadays I look back on that and I’m left with a feeling in the pit of my stomach that feels like a lead weight. I do not blame my Papa for teaching me this method. He came from a generation of people that painted their entire houses with lead based paint… where babies cut their teeth on cribs coated the stuff. At the time, it was just not a big deal. Although I don’t do much fishing anymore, lead poisoning is still a concern for me. As most of you know, I have an unquenchable desire to cover my walls with chippy reclaimed wood that has been torn out of old houses that were built during my Papa’s lifetime. The pretty vintage pieces that I bring into my home are unique, but they carry a risk that needs to be addressed. 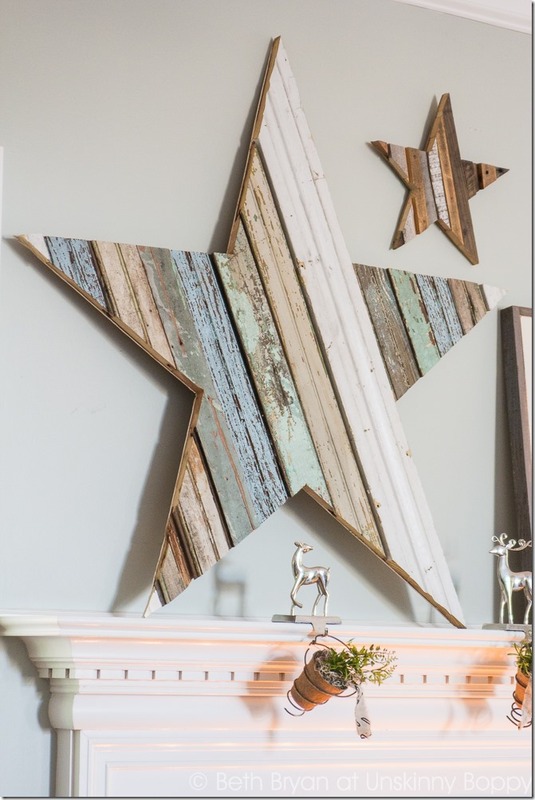 When I posted my tutorial on how to make a giant star from reclaimed wood, I got an email from a reader that stopped me in my tracks. I saw your cool giant wooden stars and instantly saw they were made with reclaimed painted wood. Because we learned the hard way, I wanted to share with you our story with painted, reclaimed wood. My husband is a hobby woodworker and a few years ago we fell in love with using reclaimed, old, chippy, lovely painted wood in projects – primarily picture frames. We had an etsy site, sold at an indie juried craft fair a couple times and he sold a couple of large starburst mirrors in a local gallery. He made all of these in his basement workshop of our 1922 home. Then our son was born in January 2012. The woodworking became less frequent, as all hobbies do when a baby arrives. At my son’s 12 month routine pediatrician checkup they tested his blood for lead (apparently routine for anyone living in a home built prior to 1978 – the year lead could no longer be added to paint). His blood had elevated levels of lead in it (not poisoning levels, but enough to cause concern). In the months since that initial test his levels have been on a roller coaster. We pray and believe that they are now only on a decline. So, needless to say we stopped all woodworking with reclaimed wood. We’ve had experts, including the state, visit our home to test the whole house and give their opinion about what we should do to make our home crazy safe (it’s doable). A tiny amount of lead paint / dust can cause harm. We were putting lead dust throughout our home (even if doing projects in a garage or detached shop are dangerous as the dust / chips can be brought inside so easily). So, if your pediatrician hasn’t tested your son it may be good to ask him/her their thoughts (it’s a simple blood test). Lead is most likely to enter into children under the age of 6. 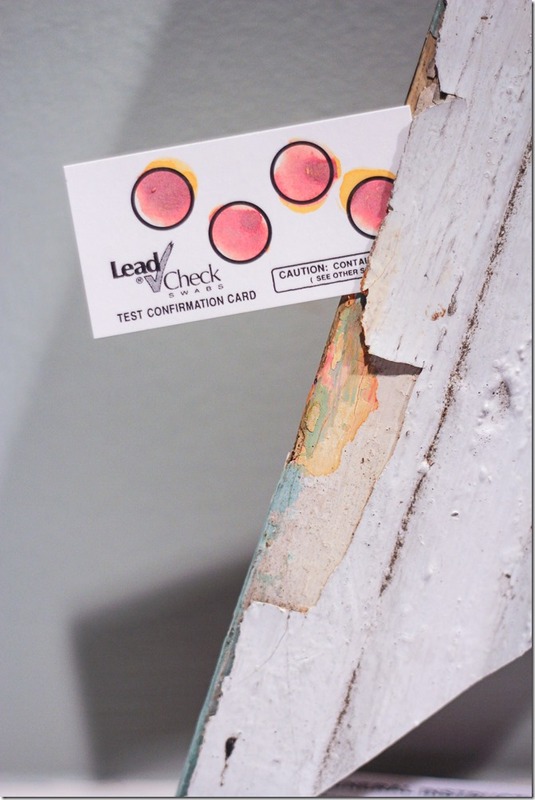 While I do consider the potential for lead paint in all of the reclaimed wood that I purchase, it has never occurred to me to be concerned about it or even test for it. Maybe because handling (and even biting!) 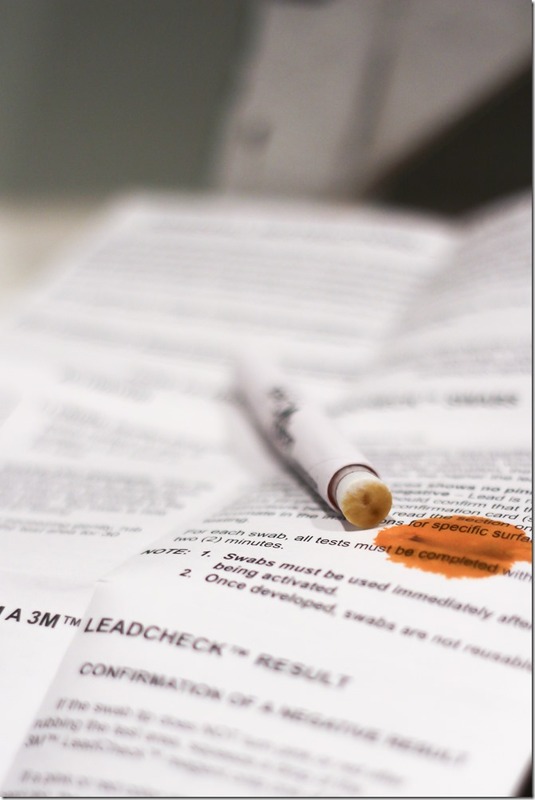 lead was something I have been doing from a very early age, it never really occurred to me to mind. I was able to confirm my suspicions about lead paint VERY quickly with this lead paint test kit from True Value Hardware. Let me show you how simple these test swabs were to use. I crushed the two points on the swab labeled “A” and “B”. This was similar to crunching a glow stick to mix the chemicals. After two shakes and a gentle squeeze you should see orange/ yellow liquid coming out of the tip of the swab. Using a knife, scrape off a small area of the paint that you want to test. If there are several layers of paint, be sure to cut all the way through each layer. Run the end of the swab over the exposed areas, and wait to see if it changes colors. Red = Lead. There is a test sheet that comes with the package for you to compare the color of the lead samples to your wood chips. After just a few seconds I was easily able to see a pinkish-red area creeping up from around the edge of my reclaimed wood star. Can you see the pink parts of the wood? That’s where the lead is hiding. So now that my suspicions about lead paint were confirmed, I began to wonder what I could do to protect my family, (especially my son) from lead exposure? In my research I found that inhaling or ingesting the sawdust and paint chips are the main danger to children. You need to decide for yourself how comfortable you are using lead based items in your home. My son is now 6 years old, and old enough to understand when I explain that something is dangerous. I trust that he won’t be chewing on any paint chips if I tell him not to do it. That doesn’t mean we can be lax, though. Sawing the materials can cause unseen damage as well. Here are some tips to help anyone else who loves the look of reclaimed wood in their decorating. Protect yourself from the dust. When cutting wood containing lead based paint, always wear disposable gloves, eye protection and a dust mask that blocks airborne particles. Control the dust. Do not work with lead based items on a windy day. Make your cuts outside your home with all windows and doors tightly sealed. If you cut indoors, airborne particles can travel through your air vents to all parts of your house. Cutting outside in a well ventilated area is safer. Clean up completely. Wash your clothing and hands thoroughly when finished working with lead paint. Remove your shoes so you don’t track in the dust. 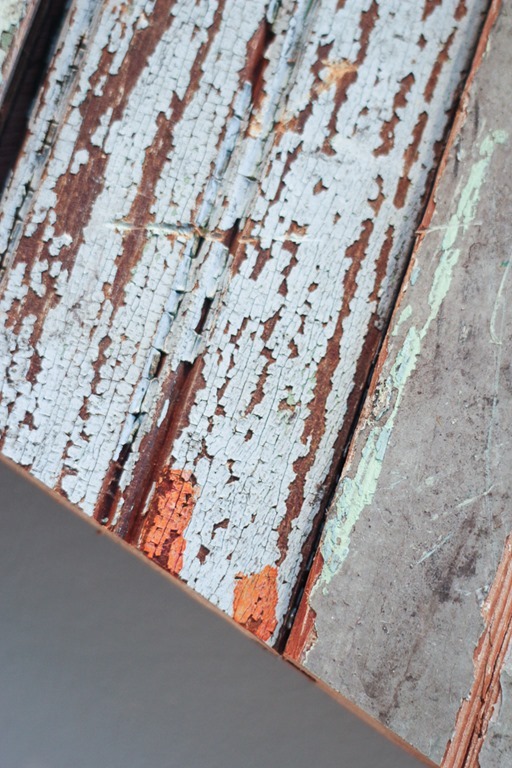 For those of you with larger DIY jobs to tackle–such as major renovations on homes built before 1978– do your research and know the correct precautions to take before using a sander or saw on any areas covered in lead based paint. Here is a great article on lead paint precautions for Do-It-Yourselfers. For more information about renovating your home that contains lead based paint on the walls, click here. When in doubt, hire it out. Find a contractor who is lead-safe certified in your area. For more information about lead paint and lead poisoning, visit the EPA’s website here. 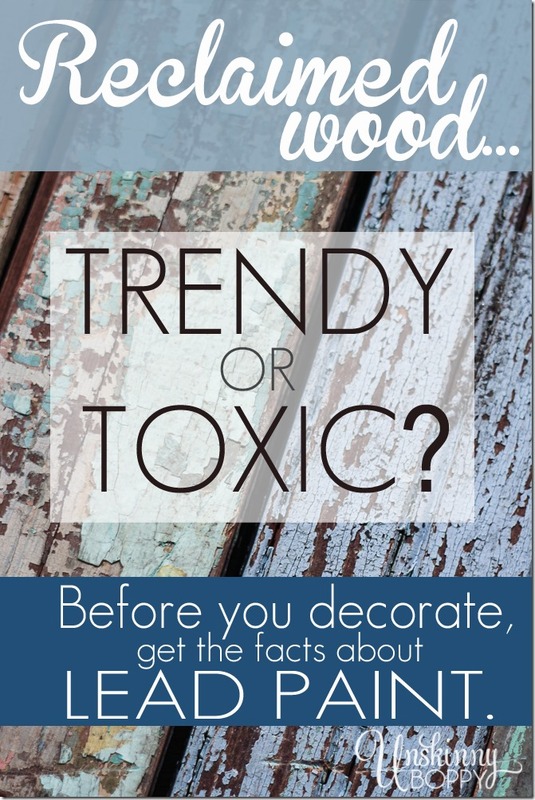 I hope this helps you to be more aware of the dangers of decorating and using lead based paint in your home. Safety should be a number one priority in every DIY job you tackle in your home. Remember that knowledge is power, so research as much as possible to make sure you’re protecting your family from unnecessary harm. This is awesome! Thanks for posting. Any thoughts about pallet wood and how to make that safe for a home? I’m so glad you covered this, Beth. Another blogger friend (His & Hers) actually posted a seriously scary story about lead poisoning that I read when Henry was littler and it freaked Ryan and I out big time. We don’t use tons of chippy paint wood, but we did renovate the entire house. This story was about lead dust from renovations sitting in vents and then blowing out. It caused lead poisoning in a little one. And no one thought anything about it because the home was head-to-toe renovated. Needless to say, it struck a chord with us. We immediately had Henry’s levels tested and finished painting a few doors that had old paint coming through. Luckily, Henry’s lead levels were very low. But, it’s still so scary. Sorry for the novel. I’m just happy to see bloggers bringing this up. I have wondered about this before. Taking every precaution is probably very wise. Great info. Beth! The fine particles from sanding are such a huge concern, and the neurological and cognitive effects of high lead levels (not just beyond “poisoning” levels) are significant. My nephew was victim of lead poisoning in my sister’s 1930’s home. They lived there when he was born. When he was about 7, he lost all of his hair on his head, eyebrows, etc. It was like that for a couple of years then finally grew back. He is now in his mid-20’s and has plenty of hair but pretty scary for a young guy like that. Doctor said it was due to lead poisoning. So, I always think of that when I fall in love with reclaimed wood. Thanks for the awareness check! I’ve never been into the reclaimed wood look I’m a very much clean and simple style person when it comes to my home. But I totally get it and can see the dangers that reclaimed wood could have. Thanks for posting this! This is a great post, Beth, and such an important one. I didn’t realize that working in a garage could lead to the lead dust getting into our house. It makes me feel a bit sick. All great tips for safety. And also . . . just don’t go around licking all your decor! Hello. Thank you for your post. We have run into this problem as well when restoring a home. We had lead paint on the floor. Who knew? Not a place I would have looked. We hired a company to strip the floors for refurnishing. It was costly, but well worth it. It was amazing to see the process. Our home was sealed off with plastic to trap the dust and debris in the main area for disposal. This was almost 20 years ago. I will be purchasing the lead testers. What a great tool to be sure. Be safe and happy DIYing! Wow! Thank you! So much of this never occurred to me. Thanks for the tips! Great post Beth, we use a lot of old boards and must be more diligent in testing the wood now that the baby is here. Thank you for the awesome reminder! Loved this article. 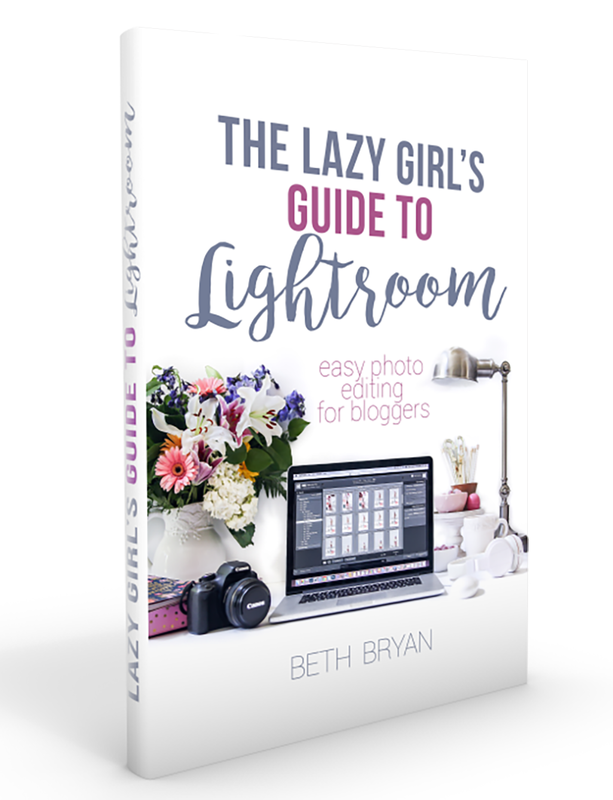 Most helpful and I will certainly share – with your permission – with all my crafty friends. OMG! I have never even thought of this, thanks so much for posting this! Did you ever have your child tested? My children were also poisoned! And we are now dealing with lifelong disabilities from the poisoning. Even levels as low as 5 have been proven to lower iq points in small children. Pallet wood is some of the worst in my opinion. The reason being is we often seek out the ones with character and those are mysterious pieces of what. Old discarded pallets are not something that is regulated or should be (to a degree). The truth is you simply never know what was shipped on it and what has potentially absorbed into the wood. 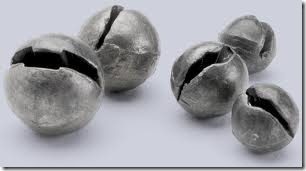 It is very common for the contents on a pallet to get dented and leak everywhere. Pallet wood is the bottom of the barrel wood and is treated as such in its lifespan. As you know, wood has a natural ability to absorb and hold onto chemicals etc. Since pallets are normally acquired through obtaining discarded ones in the trash there is no way to be 100% certain what their history or use has been. I personally would not bother asking the place that is getting rid of them since you would simply be getting an uneducated answer most of the time. Pallets make terrible surfaces for tables since they can and probably are often toxic and even if you consider putting a sheet of glass on top to protect you from direct contact you still don’t even know for sure what chemicals are being released into the air and some areas are still left exposed. There is a furniture maker in my area who is looking to employ people to pull pallets from dumpsters etc. tear down and then he will pick them up from you and pay you per piece. I find this extremely inconsiderate since he has no regard for the safety of the people whose homes he puts these pieces in. I would err on the side of caution and be done with mystery wood. Trendy or not. Had “Are” instead of “Art” when I first posted this. Please excuse my apparent shouting, but the human race needs to face facts: There is no “outside” on this planet… not really. Someone is living outside. We all go outside, do we not? Further, we are not the only inhabitants and all deserve a clean environment and I do mean ALL. The real answer is to face facts so real focus and solutions may be brought to bear on the situation. I recently came across an article about the dangers of using old palette wood and possible toxic chemicals they could be treated with. they should have a stamp somewhere on them with a letter code warning what hazards the wood contain. Many palettes are treated with all sorts of chemicals like insecticide etc depending on their original use. I don’t have the details but a search on the webs should help anyone find the codes used to determine if the palette is safe to use. I’d be wary if the palette didn’t have a code. I have an old palette and that was the case so it’s not worth the risk to my health to use it. I am working on a project with some old windows that have paint on them. I have not tested them yet. If the paint does contain lead can I use something to seal it? Something clear? I have an old door I want to bring into my home. I will do a lead test (I’m sure the paint was lead based). But I’d still like to use it. If I seal the wood with Polyurethane, shalack or something like that, would it be safe? Is there any way to make it safe? I am also looking for a clear sealant. I have an antique kitchen cabinet with shalacked wood and leaded glass fronts. I am taking out the leaded glass but want to make sure all dust is out of the wood where I want to store food. Is the varnish a good enough sealant? I work with an environmental safety firm that teaches Lead Safe Work Practices in Kansas and Missouri. My boss and I have had numerous conversations about the dangers of using reclaimed wood and using recycled doors and windows from Habitat for Humanity and other architectural element recycling places. I applaud you for this article because so few people even recognize the dangers. I do want to point out one thing about the Lead Check test kits though. 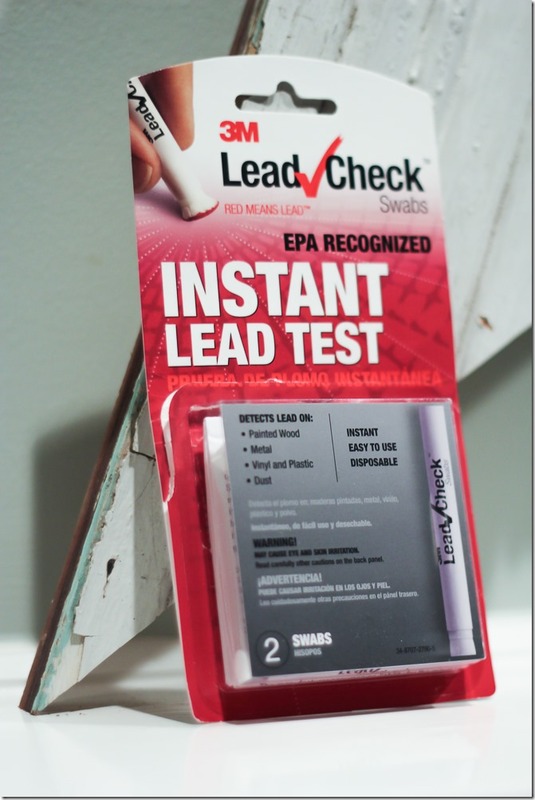 We have found at times in our classes, where we are required by the EPA regulations to demonstrate the Lead Check test kit, that we have had 100% failure of the test kits. By this I mean that neither the tested wood nor the control sample shows lead. This should not happen. The control sample should show as red regardless of the presence of lead in the tested material. EPA knows that the kits are unreliable and recommend to assume lead is present and take appropriate precautions when dealing with homes pre-1978. I would expand that warning a bit and just assume that you are dealing with lead if you are using reclaimed wood, especially prior to 1950s. 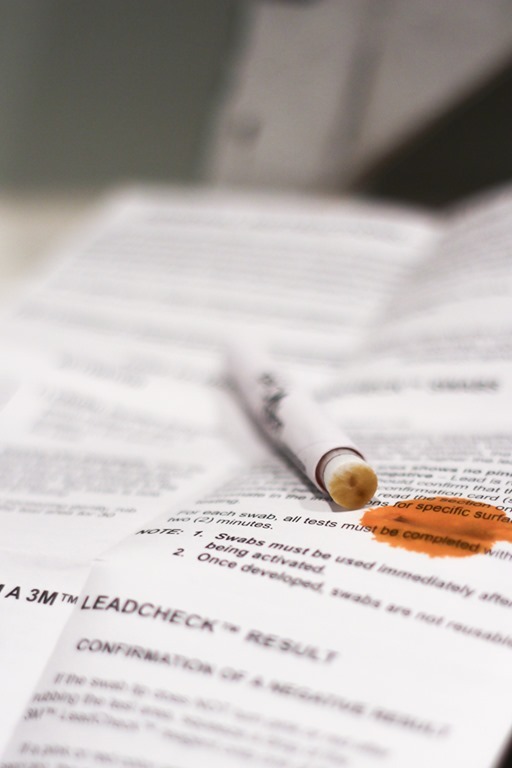 The State of Kansas finds the test kits so unreliable that they prohibit the professional use of the kits… homeowners can still purchase and use them but contractors cannot use them to determine if there is lead present. The EPA website has very good information about the precautions one must take when assuming lead is present. Just google “EPA Lead” and it will come up. There are several brochures for both the homeowner and contractor.